– Professor Bill Nasson, Department of History, Stellenbosch University. Dagga: A Short History is a conversation piece, a witty and thought-provoking overview of dagga in South Africa, its origins, background as a legal drug, and later criminalisation. An entertaining and informative take on the law and the current medical debate, it is an essential contribution to emerging issues such as licensing, legalisation and taxation. Hazel Crampton is the author of the bestselling The Sunburnt Queen (Jacana, 2004), The Side of the Sun at Noon (Jacana, 2014), and co-editor of Into the Hitherto Unknown: Ensign Beutler’s Expedition to the Eastern Cape, 1752 (Cape Town: Van Riebeeck Society, 2013). Dagga: A Short History (then, now and just now) is her fourth book. Hazel is an artist and lives in Grahamstown. The only scent that permeated the Kalk Bay Bookshop at the recent launch of Hazel Crampton’s newest publication was rain on the pavement and the tang of windblown waves. No dreadlocked Rastafarians attended the celebration of the publication of Dagga: A Short History, but when Nancy Richards, the vivacious and much-loved radio personality who joined the author in a weird and wonderful conversation, asked how many folk in the audience had tried the “sacred herb”, at least half of the gathering of suburbanites (average age 55) put up their hands. Richards, whose book Being a Woman in Cape Town was launched on Women’s Day, sang praises for Dagga. She said it told a “fascinating and eye-opening story of the ‘weed’ as it tumbled through South Africa’s colourful past and into the present. Hazel breathes life and humour into the history and raises many important questions about its future.” Having talked about Dagga as well as about her previous books, The Sunburnt Queen and The Side of the Sun at Noon, on Richards’ SAfm Literature show before, Crampton and Richards share a longstanding rapport. To hear Crampton’s take on the demonisation of dagga was utterly fascinating. She advocates for dagga being legalised, licensed and taxed. To discover more about this intriguing matter, buy the book. At just 90 pages, it’s a quick read, “for short attention spans,” Crampton says, laughing. 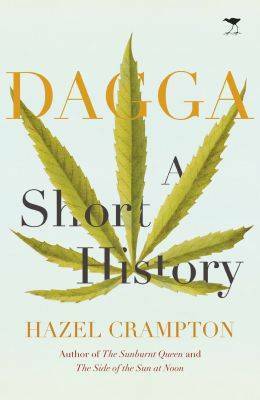 Jacana and Kalk Bay Books would like to invite you to the launch of Dagga: A Short History by Hazel Crampton. Crampton will be speaking about her new book, a witty and thought-provoking overview of dagga in South Africa, with Nancy Richards. The event will be on Tuesday, 29 September, at 6 for 6:30 PM at Kalk Bay Books. Jacana and Love Books would like to invite you to the launch of Dagga: A Short History by Hazel Crampton. Dagga: A Short History is a conversation piece, a witty and thought-provoking overview of dagga in South Africa, its origins, background as a legal drug, and later criminalisation. The launch will be on Wednesday, 9 September, at 5:30 for 6 PM at Love Books. “In a world stalked by biltong, Hazel Crampton’s latest literary cultivation is an enthralling and educative reminder of another enduring South African staple. Her pioneering short exploration of dagga displays a fine eye for telling detail, covers a lot of ground at an enjoyably brisk pace, and satisfies the reader’s inquisitiveness in all kinds of knowledgeable as well as unexpected ways. This gem of a book is enough to make you flap your wings.” – Professor Bill Nasson, Department of History, Stellenbosch University. Hazel Crampton is the author of the bestselling The Sunburnt Queen (Jacana, 2004), The Side of the Sun at Noon (Jacana, 2014), and co-editor of Into the Hitherto Unknown: Ensign Beutler’s Expedition to the Eastern Cape, 1752 (Cape Town: Van Riebeeck Society, 2013). Dagga: A Short History (then, now and just now) is her fourth book. Hazel is an artist and lives in Grahamstown. SA Politics Unspun author and political commentator Stephen Grootes has weighed in on the #RhodesMustFall debate in an op-ed for the Daily Maverick in which he categorically states that Cecil John Rhodes, and his legacy, should indeed fall. Somehow Madiba’s decision over a decade ago to allow his name to be attached to the Rhodes Foundation is now a justification to somehow keep the statue of Rhodes. Huh? Firstly, it’s a cheap shot; it’s grasping at straws. It’s shameful to try to cloak something in the shadow of Mandela. Stand on your own two feet. Secondly, Madiba was all about transition. In those days, we were what you could call a black and white country. Now, we are a black country. That doesn’t mean that we are not also a country for everyone; after all, it belongs to all who live in it. But it does mean that we can’t expect to keep symbols of our white-dominated past around. And why should we? Even if we were a different type of country, Rhodes should not be someone you want the young people of any country to look up to. Oscar: An Accident Waiting To Happen (MFBooks, Jacana), is written by award-winning journalist and best-selling author (of Smacked) Melinda Ferguson, in close collaboration with a key state witness, Patricia Taylor. Oscar: An Accident Waiting to Happen will be on shelf and simultaneously released as an ebook after the verdict has been announced. The authors and book will be featured as part of the breaking news on Good Morning America while various newspapers are presently trying to outbid each other to serialise the book. Ferguson launched MFBooks in late 2012; this is the 10th book in her imprint. Author, activist and academic, David Lewis, was welcomed at The Book Lounge early last week for the launch of his book, Thieves at the Dinner Table: Enforcing the Competition Act – a Personal Account. Lewis, who was instrumental in drafting South Africa’s competition law, has a prestigious CV. He is currently the Executive Director of the NGO, Corruption Watch, and was joined by Advocate Owen Rogers in a frank and scintillating discussion, permeated with wit. His personal account of his experience serving on the Competition Commission makes for riveting reading. Rogers launched the discussion with the question, “Who are the thieves? And at whose dinner table do they sit?” Lewis replied that, when they tackled the case of the bread cartel and those involved became contrite and admitted guilt, the Human Rights Commission referred to those who fixed bread prices as “thieves at the dinner table”. This struck Lewis as an apt description of the scenario and completed the task of finding a suitably exciting title for his book. However, he noted that some readers had bought the book under the misapprehension that it is a thriller. Rogers highlighted the 15 years Lewis spent as a trade unionist in the anti-apartheid movement and asked whether this time gave him an accurate and fair insight into the world of business or whether it had skewered his perception of the way business operated. Lewis said he’d gained a healthy skepticism and, although he has never worked in a business, his work has always been involved directly with business: “I was always fascinated by business, and even in the union movement grew to a grudging respect of certain business people. I did come into it with a strong skepticism and strong awareness of what damage could be done without countervailing forces,” he said. Owen recalled that Lewis was no “lover of lawyers” and had been known to call down plagues and poxes upon the heads of his esteemed colleagues. Additionally, competition law is a highly complex mix of economics and law. When Owen asked Lewis what the challenges to the legal profession in the field are, Lewis said he “loved to hate lawyers” and really enjoyed the theatre of the law. While he takes pleasure in television court room dramas, seeing them in person is “fantastic”! The lively and entertaining discussion concluded with questions and answers from the floor, in which a number of Lewis’ colleagues participated. The Competition Commission (together with its Tribunal) is one of the success stories of the new, democratic South Africa, an institution that has won respect and admiration for its fearless, professional regulation of the market in the interests of the consumer and the citizen. David Lewis was one of the chief architects of the new competition authorities set up after 1994 and then became a leading actor in their work. Thieves at the Dinner Table is a personal account of David Lewis’s headship of the Tribunal and tells, with insight, lucidity and often a fine sense of humour, of the way this new body dealt with the anticompetitive practices of South African big business. Three main aspects of the Commission’s work are dealt with in the book: mergers, abuse of dominance (i.e. monopolies) and cartels, and with each Lewis provides telling case studies drawn from the experience of the Commission. These are often enlivened by the author’s coruscating wit and by his delightful thumbnail sketches of the characters involved in the disputes, including the powerful and arrogant captains of industry, the wily Johannesburg competition lawyers, and the interfering and self-promoting politicians. This is a book for people in business and in law, for those who want to understand how a key institution of post-apartheid South Africa came to be so successful, and for all those interested in the story of how some of the country’s most powerful businesses got their comeuppance after years of ripping off consumers. David Lewis, who taught at the Gordon Institute of Business Science after his term at the Competition Tribunal ended, is now head of the NGO Corruption Watch. Ronnie Kasrils, author of award-winning The Unlikely Secret Agent, says the revisions to the Information Bill favour secrecy over preserving the spirit of our constitution. He says the latest incarnation of the bill cites vague concepts such as “the public good” and “survival of the state” as reasons for protecting information from “unlawful disclosure”. The latest version of the Protection of Information Bill being discussed by the ad hoc parliamentary committee is looking more dangerous than ever. Just what manner of creature are we seeing emerge? The committee is bogged down in a cut-and-paste job, and the legislation is becoming a web of ill-conceived notions, biased towards secrecy and less and less expressing the spirit of our constitution. When I was considering the need to replace the 1982 Protection of Information Act, which presently governs us, the late Kader Asmal quipped: “Better let sleeping dogs lie.” Agreeing that the apartheid-era law needed repealing, however, he advised that I involve human rights lawyers to draft the new legislation. This I did. Our aim was to limit secret information to explicitly defined areas; contribute to a culture of openness befitting our new democracy; and release at the stroke of a pen tons of needlessly classified information from the apartheid-era to the present.